A sound, a smell, a word can all flood our minds with memories of past experiences. In a study of epilepsy patients, researchers at the National Institutes of Health found that split seconds before we recall these events tiny electrical waves, called ripples, may flow through key parts of our brains that help store our memories, setting the stage for successful retrieval. The study was led by Alex P. Vaz, B.S., an M.D., Ph.D. student at Duke University, Durham, North Carolina, who was completing his dissertation work with Dr. Zaghloul. For years, Dr. Zaghloul’s team has been using grids of surgically implanted electrodes to record the electrical brain activity of drug resistant epilepsy patients enrolled in a trial at the NIH’s Clinical Center. The recordings have helped identify the source of a patient’s epileptic seizures as well as provide an opportunity to study how the brain encodes memories. As many labs have established, Dr. Zaghloul’s team knew that our episodic memories are controlled by neurons in at least two different parts of the brain, but they did not know exactly how the cells worked together to retrieve memories. Based on a growing of body of evidence, they suspected that the short, high frequency electrical waves seen in ripples may somehow be involved. For instance, two earlier patient studies suggested that ripples may be important for solidifying memories during sleep. Then, in 2017, one group observed ripples flowing simultaneously in the medial temporal lobe (MTL) and the neocortex of rat brains and that this activity appeared to play a role in learning. That’s when Vaz got the idea to look for ripples within the reams of data Dr. Zaghloul’s team had been collecting from patients. 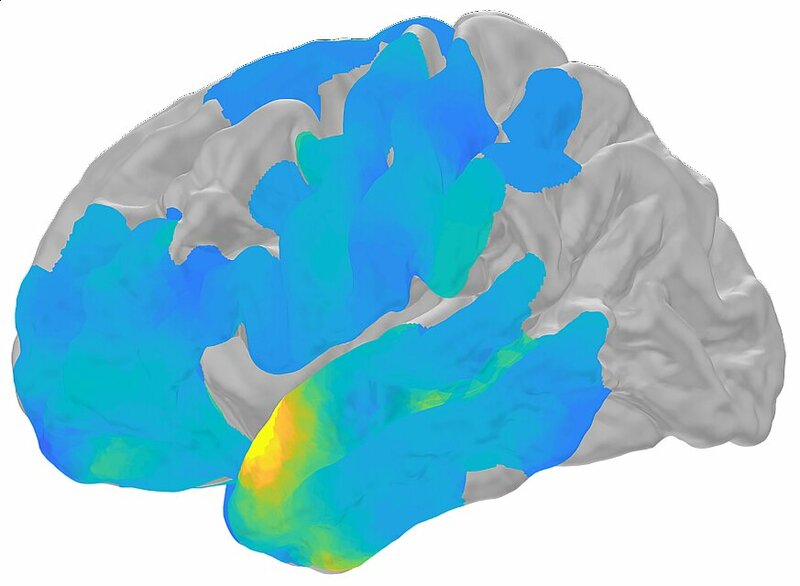 By reanalyzing the data, the team also found ripple activity in key parts of the patients’ brains. Specifically, they saw ripples occurring nearly simultaneously in the MTL and the association cortex, an area of the neocortex known to process our experiences. In other words, when they spotted ripples in one area, then there was a good chance they would find them in the other. In contrast, they saw no evidence of coordinated activity between the MTL and the cortical areas of the brain that control our movements and sensations, suggesting the simultaneous activity they observed may be related to episodic memory. Next, they analyzed data recorded while the patients played memory games. For this, patients sat in front of a screen and were asked to learn pairs of words, such as “finger” and “needle.” Later, their memories were tested by flashing a word on the screen and asking the patient to state its paired word. The team discovered that the simultaneous ripple activity often happened a few milliseconds before a patient would correctly remember a word pair. No coordination was seen when the patients answered incorrectly, nor did it occur when the patients were learning the pairs. Finally, the team found that the ripple synchronization seen before correct memory recall often triggered electrical activity patterns like those seen in the association cortex during learning. Several studies have shown that when we retrieve memories the brain reactivates neural activity that happened when we first experienced an event. The team’s findings suggested that the coordinated ripples between the MTL and the neocortex may be an important part of that process. “Our results suggest that coordinated ripple activity may play a critical role in replaying the neural codes behind our memories,” said Dr. Zaghloul. Dr. Zaghloul’s lab is currently exploring this phenomenon in greater detail and hopes to understand how the synchronized ripples may influence other neural signals and features that have also been linked to successful memory recall. These studies were supported by NINDS’ Intramural Research Program and an NIH training grant (GM007171). Bitcoin, Ethereum, Ripple all survived an attack, will they rise?